KANSAS CITY, KAN. ----- Kansas City Kansas Community College will take a six-game winning streak and No. 11 national Division II women’s basketball ranking into the holiday break after passing one of their toughest tests at Cottey College in Nevada, Mo., Tuesday night. Trailing by eight points with 6½ minutes, the Lady Blue Devils rallied for a 79-76 win to boost their mid-season’s record to 12-1. A sweep in the Southeast Nebraska Classic last week vaulted KCKCC from 15th to 11th in the latest NJCAA poll, which has Jayhawk Conference rivals Highland and Johnson County ranked No. 3 and No. 5 respectively . 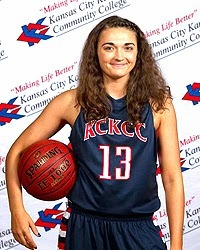 “Cassidy Harbert and Julia Garrard really carried us the second half,” said KCKCC Coach Valerie Stambersky. Garrard had 11 of her career high 18 points in the second half and led in rebounding with 10; Harbert had four of her six field goals down the stretch on the way to a near triple double. A freshman from Wichita Northwest, Harbert had 14 points, a career high 11 assists and eight rebounds. The 11 assists are the fourth most in KCKCC history. The Blue Devils also got big second half contributions from Bailey West and Imani White. West had all of her eight points in the second half; White eight of her 13. KCKCC used a 6-0 run to wipe out most of the 8-point deficit and then went ahead to stay on Rashaun Casey’s 3-point goal with less than two minutes to play. The Blue Devils were almost sabotaged by free throw shooting that was as cold as the weather outside, converting only 10 of 19 for 52.6 percent. However, they were able to dominate the rebounding 45-35. The Lady Blue Devils are now idle until Saturday, Jan. 4, when they have a return home game with Cottey at 2 p.m. Meanwhile, the Blue Devil men will close out first semester play Saturday when they face Mineral Area at Park University in Parkville at 2 p.m.